The Post Register is one of Idaho’s oldest and largest newspapers. We produced last year’s Intermountain Energy Summit that brought U.S. Energy Secretary Ernest Moniz to Idaho Falls, drawing attendees from 20 states and two Canadian provinces. We’ll be producing the second annual IES this August, which we expect to be even more successful. Newspapers are ideal for producing substantive, policy-oriented conferences such as the IES and the Idaho Healthcare Summit. We bring a journalistic sensibility to the process that often is lacking in conferences produced by entities with a more limited agenda. While sponsors such as Blue Cross of Idaho are essential to a good conference, having a third party with a journalism background as the producer helps ensure the conference is, in both actuality and perception, as balanced and broad-based as possible. Additionally, it helps bring together businesses and organizations that otherwise are fiercely competitive with each other. Most of southern Idaho’s major healthcare payers and providers have joined forces to support the conference. That would not have been possible had one of these organizations been the organizer. So, we have developed a partnership combining the financial support and expertise of Idaho’s healthcare industry with the journalistic perspectives of the Post Register. Our years of journalism experience in Idaho helped connect the dots between all the relevant parties. Our objective is to bring together the best thinkers from Idaho and across the country to address Idaho’s healthcare issues at the highest possible level. From national policy — hence the keynote addresses by two former HHS secretaries — to very practical issues of importance to Idaho employers and healthcare providers, we intend to provide broad and substantive day of engagement. All sessions will include lengthy Q&A sessions and we are disallowing any PowerPoints! Why Ft. Hall? The ShoBan Events Center is the newest, largest and best-equipped conference center in eastern Idaho, and we wanted to show that a statewide conference didn’t have to happen in Boise. It’s a central eastern Idaho location and will be a perfect venue for the conference. We also intend for this to be just the first such conference. We envision future similar conferences in southwestern and northern Idaho, modeled on what we expect to be the major success of our inaugural conference. 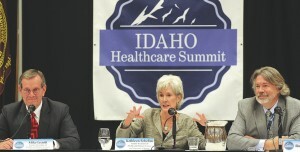 Editor’s note: The Post Register helped sponsor and organize the Idaho Health Care Summit. FORT HALL — The unsustainable cost of health care in the U.S. was the central focus for many of the country’s leading experts, who gathered for the first Idaho Health Care Summit on Wednesday. The day-long event explored a variety of topics, from Medicaid and alternatives in health-care delivery to specialty drugs and employer-provided health plans to the Affordable Care Act. “The United States has citizens who live sicker and die younger than most of our competitors,” said Kathleen Sebelius, a former Kansas governor who served as secretary of Health and Human Services from 2009 to 2014. That’s not for a lack of money in the system, Sebelius said. Rather, the U.S. spends much more on health care than any other nation in the world, just as it did in 2009 before passage of the Affordable Care Act. “We were not getting a very good bang for that buck,” she said. Mike Leavitt agreed. The former Utah governor served as secretary of Health and Human Services from 2005 to 2009. “We cannot remain an economic leader and spend 20 percent of the gross domestic product on health care,” Leavitt said. Leavitt said the country is on the verge of major changes to its health-care system, driven not by government policy but by the economic imperative to find a more efficient system. Instead, Leavitt said, the system should pay doctors to keep people healthy through regular primary care, which is much less expensive than waiting until a condition needs emergency treatment. Leavitt shared a personal story about how early intervention can lead to significant savings. One fall day, he said, he saw what appeared to be an ingrown hair near his knee. He ignored it at first, but it kept getting worse and the infection began to spread. First, he tried a topical antibiotic. Later, he received a prescription for an oral antibiotic. But the infection kept getting worse. Finally, Leavitt said he called the CEO of a local hospital, who put him in touch with another doctor. After running tests, that doctor came back with a different diagnosis. Leavitt had contracted MRSA — a form of staff infection highly resistant to antibiotics. Doctors were able to treat him by removing the infected tissue, Leavitt said. In all, the ordeal cost him a few thousand dollars. But the infection was very close to spreading into his knee. Had that happened, he would have been hospitalized for weeks on round-the-clock intravenous antibiotics. It would have cost hundreds of thousands of dollars, he said. Such high costs have huge effects on American life. The federal government spends more than $1 trillion on health care each year, Sebelius said. That means if the U.S. made a serious dent in health-care costs, the positive effects on the federal budget could be immense. According the Commonwealth Fund, the annual cost of health care for an average citizen of the United Kingdom is about 40 percent of the annual cost in the United States — and the U.K. outperforms the U.S. in most measures of public health. Projecting those savings onto federal health-care spending, the federal government could save more than $600 billion a year by bringing costs in line with those in the U.K. That would mean a substantial federal budget surplus, rather than a deficit. Idaho State University electrical engineering professor Mikle Ellis raised a question: If so many countries with national heath care systems get better results for less money, then why not just do what they do? Sebelius said such an outcome was politically unfeasible. Leavitt said sometimes patients are forced to wait for medical procedures under such health-care systems. Jeff Crouch, vice president of provider services at Blue Cross of Idaho, said high health-care costs harm working people, too. For most workers, he said, wages have stagnated for years. Much of that stagnation is due to the rising cost of health care, he said, because employers who have to put more into benefits are less likely to raise wages. A median family of four makes about $55,000 a year in wages, Crouch said. But their average health insurance plan is worth $25,000. The system can’t go on if it takes an amount approaching half a family’s income to obtain reliable access to care, he said. At one summit session Wednesday, Senate Pro Tem Brent Hill, R-Rexburg, said he does not does not see many prospects for Medicaid expansion at next year’s legislative session. He began by asking for a show of hands: Who in the crowd of more than 100 doctors, insurance officials and hospital executives would favor Medicaid expansion? Nearly every hand went up. And who would be opposed? Only three hands were raised, two of which were legislators’. “My job is to explain why your Legislature seems to be ignoring you,” Hill said. While it has been argued that Medicaid expansion would save the state hundreds of millions of dollars, provide health care to the vulnerable and save lives, Hill said, it could also increase dependence on federal programs, reduce personal responsibility and interfere with the free market. “Those arguments, and any other arguments you can come up with, are the exact arguments that were used to pass the Affordable Care Act. And I don’t know one Republican who would have voted for the Affordable Care Act,” he said. House Minority Leader John Rusche, D-Lewiston, was blunt in his assessment, saying politics were getting in the way of sound policy choices. “The financials and the clinical cases are undeniable, and the political barriers are unsolvable,” he said.